Australia's response to boat refugees is marked by regimentation, dehumanisation, incarceration and isolation. The way we respond to those seeking shelter inside our borders is eerily similar to the 18th century response by the British when they incarcerated, dehumanised, regimented, isolated and transported thousands of their unwanted lower classes. Those on the First Fleet were sent to the penal colonies on the far-away island of Australia under the British policy of transportation. White Australians started their community as a horde of petty criminals sent to the most remote place British authorities could find. Modern-day Australia began, as author Tom Keneally states, as a Commonwealth of Thieves. It should not surprise that we reacted in the same way when boat refugees first started arriving. Submissions to 1979 Cabinet meetings, during the period of former Prime Minister Malcolm Fraser's government, presented by his Immigration Minister Michael McKellar, detail proposals to establish an "international reception centre", before adding that "under no circumstances should Australia offer ... such a centre on its territory" in order to "diminish the likelihood of boat people seeking first refuge in Australia". A remote island or inland location "with natural protection" is suggested "to secure containment". British government documents reveal 1979 telephone communication from Prime Minister Margaret Thatcher to Fraser, suggesting purchase of an island "as a place of settlement" for them all in Indonesia or the Philippines. When boats started arriving again during the Howard government around 2000, we sent them to the island nation of Nauru and Manus Island off Papua New Guinea - and we went on to built a gigantic montrosity refugee jail on Christmas Island. Then, in 2010, when a new increase of boats demanded a government response, King Island (Bass Strait, off Tasmania) was on the cards. More speculatively, rumours also surfaced about the use of Peat Island (Hawkesbury River, north of Sydney) also known as Rabbit Island, formerly the home of a psychiatric hospital and rehabilitation centre. This page serves as a brief reminder that Australia's obsessive focus on the compulsory jailing of asylum seekers may well have its roots in Australia's national character as a Nation of Thieves, and it does so to signpost our media response to the reopening of the Curtin Detention Centre by the newly elected Julia Gillard government with Immigration Minister Chris Bowen. The page includes the report of former UK Prime Minister Margaret Thatcher's 1979 phone call to former PM Malcolm Fraser, and it provides a glimpse into the desperate search find ever more mandatory detention facilities to cope with an increased influx of asylum seeker vessels. Not only was a new South Australian facility found in the Inverbrackie detention centre, other remote locations were also flagged by immigration bureaucrats: the remote King Island in the Bass Strait between the Australian mainland and Tasmania, and Peat Island in the Hawkesbury River north of Sydney, also known as Rabbit Island, was raised as an option. 16 August 2008: Welcome to our Christmas Island Gulag, says Immigration - In an unprecedented move, The "new mugs" immigration department invited more than 50 community representatives, working with NGO's who work with asylum seekers and refugees, to 'inspect' Australia's Island Gulag on Christmas Island. While the general flyer sent to the invited guests stated 'no photographs in detention centres', they were told on arrival that taking pictures was fine and we received more than 50 images from one of the many invited guests. Here they are, together with the reaction of those delegates who were invited to the trip: condemnation was handed out liberally, all around. 9 February 2008: The End of Howard's cynical Pacific Solution - 'The last 21 Sri Lankan asylum seekers on Nauru have been recognised as refugees and approved for resettlement in Australia, closing the book on John Howard's notorious "Pacific Solution".' Here's a page bringing the news, marking the end of a dark chapter. 21 October 2003: Horror on Manus Island: the story of Aladdin Sisalem - In July 2003 Australians were told that Australia's Pacific Solution Lombrum Processing Centre on Manus Island was no longer operational. But DIMIA left one asylum seeker to rot on the Island. Aladdin was Palestinian and Stateless, and Australia claimed, after having locked him up, to have no responsibility for him. Fearful of a public backlash against Vietnamese refugees, Margaret Thatcher asked Australia to help buy an island to resettle them, British cabinet documents from 1979 reveal. Released after 30 years of mandatory suppression, the Downing Street papers reveal the extent of the then British prime minister's aversion to granting asylum to 10,000 boat people at the United Nations' request. The Iron Lady warned her ministers of "riots in the streets" and hatched a plan to have then Australian prime minister Malcolm Fraser jointly purchase an island in Indonesia or the Philippines - "not only as a staging post but as a place of settlement" for them all, the papers said. 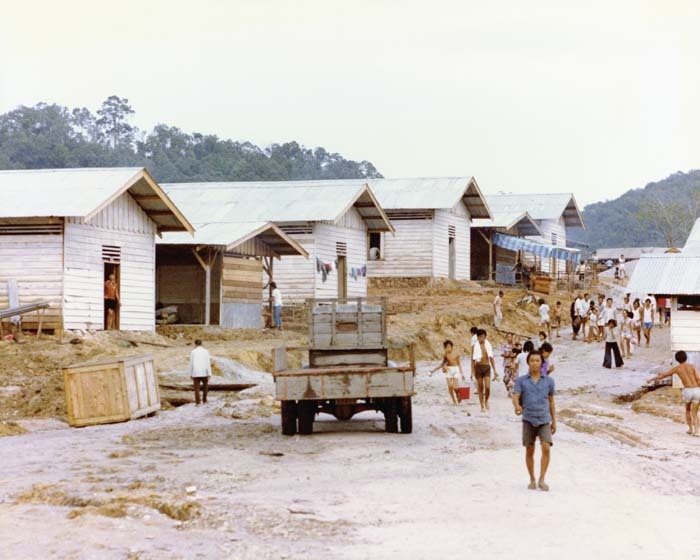 The plan for a refugee colony was blocked by Lee Kuan Yew of Singapore, who was concerned it could become a "rival entrepreneurial city". The former Liberal prime minister was unable to recall the proposal yesterday but he noted Britain's reluctance to assist the resettlement effort. "I've got absolutely no recollection of it. I've got a fairly good memory for what happened at the time," Mr Fraser said. "The British were not involved in taking a large number of Vietnamese refugees. We were, Canada was, America was and France took a great many." Australia eventually became home to about 220,000 Vietnamese refugees. Canada took a few more, the US more than a million, and France about 90,000. "One of the problems was a lot of the people fleeing Vietnam were doing so in boats that... were totally unsuitable for survival at sea," Mr Fraser said. "Therefore, it was essential to try and establish centres they could get to without making the journey longer than it had to be." Malaysia had initially pushed boats back out to sea and many refugees were believed to have drowned. "As a result of diplomacy, they agreed to establish holding centres. That was on the understanding that we, and other refugee recipient countries, were going to take a very large number so they weren't all going to be left as a problem for Malaysia," he said. A similar global effort was needed now, Mr Fraser said. Repeated Opposition criticism of the Government's border protection policies perpetuated a myth, he said. "It's obviously nonsense. Politicians would be surprised how much support a political party would get if it truly stated the case for asylum seekers and refugees and explained the circumstances from which they are fleeing. "It shows a lot of courage to leave everything you know behind to try to get a better future for your family." 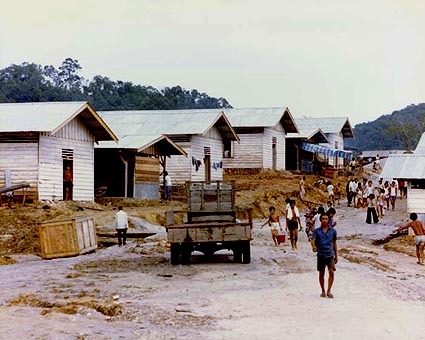 The Fraser government's liberal attitude to Vietnamese refugees met no political opposition. MARK COLVIN: As we've heard, the Immigration Minister has announced an expansion of facilities at the Curtin Detention Centre, in Western Australia's Kimberley. The centre, once described as a hell hole, was closed in 2002 after a series of riots and other incidents. It was reopened earlier this year to house detained men. The Derby Shire president says the first she heard of the Curtin centre's expansion was on the radio. Refugee advocates say the Government should be using options closer to large population centres. DAVID WEBER: The reopening of the Curtin Detention Centre has provided an economic boom for the town of Derby, about 40 kilometres away. So the Shire Council supports the expansion. But the president Elsia Archer says she was surprised to find out via the radio. ELSIA ARCHER: Well, it would have been nice had he let local government know that it was happening. I mean I guess the goss has been out there in the public but not as a certainty, but he made the announcement and I heard it on the radio. DAVID WEBER: What impact will this have because it's an expansion of accommodation for several hundred people and I suppose there would be room there for more expansion? ELSIA ARCHER: Well it is a huge piece of land and yes there is and I mean, I guess my concern at this point in time, even though we support it, we the Shire, is the accommodation in town for the staff. And at the moment it's fairly critical and because, you know, there's a lot of people and that's the great thing about it this time is that they are in town. Whereas the eight to nine years ago when they were there, they lived in dongas out there and flew in and flew out and there wasn't a lot of gain for the community. This time around it's a wee bit different and they live in town. And I guess the downside to that is there's not a lot of housing around and rents have gone up. And I know there are people trying to do something to get some extra accommodation up for this but of course that's not going to happen overnight. DAVID WEBER: Refugee advocates say they're disappointed that the Government's solution to dealing with increasing numbers of asylum seekers is basically an old one. Jack Smit of Project SafeCom says people who may be found to be refugees could be emotionally scarred by being in detention in an isolated place. JACK SMIT: We've had comments from Dr Louise Newman that we're on the verge of serious mental health issues in detention centres. There is overcrowding and he's going to alleviate that but it's back to the same old solutions, put asylum seekers, who have done nothing illegal, in harsh areas in seriously isolated areas. DAVID WEBER: Mr Smit says he believes the Immigration Minister should be taking more advice from outside of the department. JACK SMIT: You know, I was hoping that the new Immigration Minister would take note of a lot more comments than just a briefing from the Immigration Department. I mean, you know, forgive him, he is very new, so he needs to take his briefings, but it seems that this decision is based on advice given to him by the Immigration Department. We would hope that this new minister would try to set something new in motion and yet he's resorted to the old and distrusted and staid solutions, always advocated by a controlling and harsh Immigration Department and it's disappointing. DAVID WEBER: Given the increasing numbers of asylum seekers coming to Australia, what are the options? JACK SMIT: There are many options and a number of them were, a little bit sensationally, but they were raised this week in the media. There is an old army barracks in Northam. Now Northam is 110 kilometres from Perth. That will mean that within an hour we can cart people to a hospital if that's needed, access to trauma counselling. Then there is the factor of cost. We have a bottomless pit of money available to lock up asylum seekers at extravagant costs. We can halve or quarter the cost if we have the decency of detaining them with minimum fuss in or near capital cities. We constantly see this urge to isolate people as far as possible from other human beings. That in itself is a shocking practice and we cannot seem to part with it. MARK COLVIN: Refugee advocate Jack Smit of Project SafeCom speaking to David Weber. Curtin, once described as a "hell hole", was closed in 2002 after a series of riots and other incidents. It was reopened earlier this year to house detained men. Refugee advocates say the Government should house asylum seekers closer to capital cities rather than expand detention centres in remote areas of Australia. Immigration Minister Chris Bowen today announced the capacity of WA's Curtin Detention Centre in the Kimberley would be doubled to hold an extra 600 men, while Scherger Air Force base near Weipa in far north Queensland would be able to take 300 men. Mr Bowen says the extra beds are needed while refugee applications are being processed. The expansion of facilities is expected to cost $50 million. "We've had comments from [the head of the government's advisory group on asylum seekers] Dr Louise Newman that we're on the verge of serious mental health issues in detention centres," he said. "There is overcrowding and [the Minister's] going to alleviate that, but it's back to the same old solutions - put asylum seekers who have done nothing illegal in harsh areas, in seriously isolated areas." Mr Smit says he believes Mr Bowen should be taking more advice from outside of the Immigration Department. "I was hoping the new Immigration Minister would take note of a lot more comments than just a briefing from the Immigration Department. "Forgive him, he is very new so he needs to take his briefings, but it seems that this decision is based on advice given to him by the Immigration Department. "We would hope that this new minister would try to set something new in motion, and yet he's resorted to the old and distrusted and staid solutions always advocated by a controlling and harsh Immigration Department, and it's disappointing." Mr Smit says there are alternatives to using the Curtin centre. "There is an old army barracks in Northam. Now Northam is 110 kilometres from Perth - that will mean that within an hour we can cart people to a hospital if that's needed, access to trauma counselling," he said. "Then there is the factor of cost. We have a bottomless pit of money available to lock up asylum seekers at extravagant costs. "We can halve or quarter the cost if we have the decency of detaining them with minimum fuss in or near capital cities. "We constantly see this urge to isolate people as far as possible from other human beings. That in itself is a shocking practice and we cannot seem to part with it." 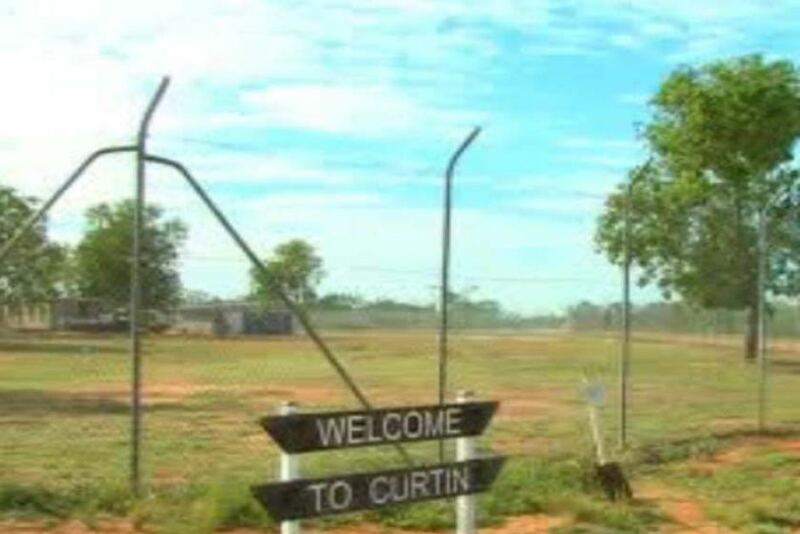 The reopening of the Curtin Detention Centre has provided an economic boom for the town of Derby about 40 kilometres away so the shire council supports the expansion, but president Elisa Archer says she was surprised to find out via the radio. "Well it would have been nice had he [Chris Bowen] let local government know that it was happening," Ms Archer said. "I guess the goss has been out there in the public but not as a certainty. He made the announcement and I heard it on the radio." Ms Archer is concerned there will not be enough accommodation in the town to house staff working at the centre. "At the moment it's fairly critical and there's a lot of people - that's the great thing about it this time is that they are in town, whereas eight to nine years ago when they were there, they lived in dongas out there and flew in and flew out, and there wasn't a lot of gain for the community," she said. "This time around it's a wee bit different and they live in town. I guess the downside to that is there's not a lot of housing around and rents have gone up. "I know there are people trying to do something to get some extra accommodation up for this, but that's not going to happen overnight." The RAAF Scherger facility is a non-operational base on the northern Gulf near Weipa. It can be activated for air attacks against an invading force but currently it is only used for exercises. The Weipa Town Authority says it is a first-class facility, but chairwoman Carrie Gay says there was no consultation over the decision. "I can only really speak for myself. As I said, we haven't had a council meeting on this, but I personally welcome it," Ms Gay said. Ms Gay says it will be good for the community. "I don't think there'll be much impact at all," she said. "I'm hoping that supplies and things will come through Weipa. I hope it has a positive effect on Weipa." She says all the base needs to be operational is a perimeter fence. The Federal Government has revealed how much it will cost to build two new detention centres to deal with an influx of asylum seekers. Immigration Department officials have told a Senate estimates hearing the new centre at Northam, near Perth, will cost more than $164 million. The Inverbrackie facility, in the Adelaide Hills, will use buildings on the site and will cost just under $10 million. The department says those amounts do not include the ongoing costs of running the centres. The department also told the hearing it is considering the possibility of settling asylum seekers on King Island in Bass Strait. While it has not yet funded a feasibility study into the idea, the department's Jamie Fox says there have been discussions with the mayor of the island. "That discussion was around whether it would be feasible for us to settle refugees on King Island or in the alternative, whether it would be feasible for people when they've already settled in Australia to move up to King Island for employment opportunities," she said. Meanwhile, the Federal Opposition has seized on comments from the Immigration Department to attack the Government's proposed regional processing centre in East Timor. Department secretary Andrew Metcalfe told the hearing the Government has not yet established which countries will be part of the regional solution. He says the Government will work with countries involved in the Bali Process to work out who will participate. Opposition Immigration spokesman Scott Morrison says that shows the Government's proposal is half baked. "They've bandied this term region around now for three months and they haven't even decided who's in the region," he said. "When challenged they nominated the Bali Process membership, which includes countries like Turkey Mongolia, Palau and Afghanistan. "This is a Government who has not thought through this proposal at all." Mr Metcalfe also told the hearing the processing centre would probably only receive people travelling to or through the region, not those from the region claiming asylum. Mr Morrison says that is a recipe for disaster. He says the proposed regional processing centre in East Timor will be a magnet for people hoping to come to Australia. "If that's not an asylum magnet I don't know what is," he said. "We are setting up under this Government a regional processing centre that will invite people to come to the region to be processed in East Timor. "All they have to do is get to the fringe of the region and those people will be as close to Australia as they could ever hope to be." Locals have expressed concern about the future of Peat Island, amid speculation it has been canvassed as a possible site for housing asylum seekers. Former federal MP Jim Lloyd has called on the federal and state governments to release plans for the vacated island in the Hawkesbury River, north of Sydney, which was once a psychiatric hospital and rehabilitation centre. With tensions mounting in South Australian and West Australian communities about plans to open two centres for asylum seekers, opposition immigration spokesman Scott Morrison wants the Gillard government to list all sites "that have been considered or investigated by the [immigration] department as potential suitable sites or facilities for asylum seeker accommodation". Mr Morrison submitted a list of questions to the Senate and said he was determined to extract answers on all sites considered rather than only those tagged as contingencies. "Does the department or the government have any further plans to expand existing detention facilities on the mainland? If so when and where and at what cost?" the document read. "Have any contracts been signed to conduct that expansion work? With who and in relation to which detention centres? What were the dates that those contracts were signed?" Mr Lloyd, formerly the member for Robertson, said he was aware of concerns in his community about the fate of Peat Island, which lies west of the F3 and is connected by a causeway to Mooney Mooney. The island, originally known as Rabbit Island, was renamed after George Peat, a ship builder who ran a ferry service across the river in the 1840s. A psychiatric hospital was built on the site in 1911. Mr Lloyd has had a meeting with the State Property Authority to determine the future of the island. "There are concerns over the uncertainty of the situation and we need to get clarity," he said. An Immigration Department spokesman said he was unaware of any immediate plans to convert Peat Island into accommodation for asylum seekers. The NSW government redeveloped Peat Island as a retirement village in 2006 but it was closed in 2008. A boat carrying 26 suspected asylum seekers, was intercepted near Ashmore Islands, off the West Australian coast, on Friday evening. That brought the tally of boat people this year to 5459 - 50 shy of a record number of boat arrivals in a calendar year, Mr Morrison said.